The cover of A Tejano Country Christmas is a shot of the riverwalk in San Antonio all in lights for the holiday season. 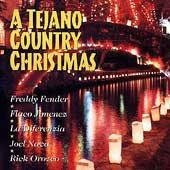 Within in album, Freddy Fender, Flaco Jimenez, La Differenzia, Joel Nava, Rick Orozco each contribute Tejano flavored takes on familiar songs of the season. Tejano is a sort of rough mix of country, norteno, and a few other things -- and there are plenty who’d think that a far too simple definition. In any case, there are fine voices, great rhythm, a sense of fun and a sense of reverence, so all the elements of a good holiday record are in order, especially if you grew up along the southern border of the United States or other areas where Spanish is widely spoken. Here you’ll find danceable versions Frosty el Snowman and Blanca Navidad, along with Jingle Bell Rock and Jingle Bells. The sacred side of the holiday is there too, with Amigos del Mundo, Adeste Fidelis, and Noche de Paz. Whether you know Spanish or not, these singers will have you joining in on familiar melodies before they’re done.